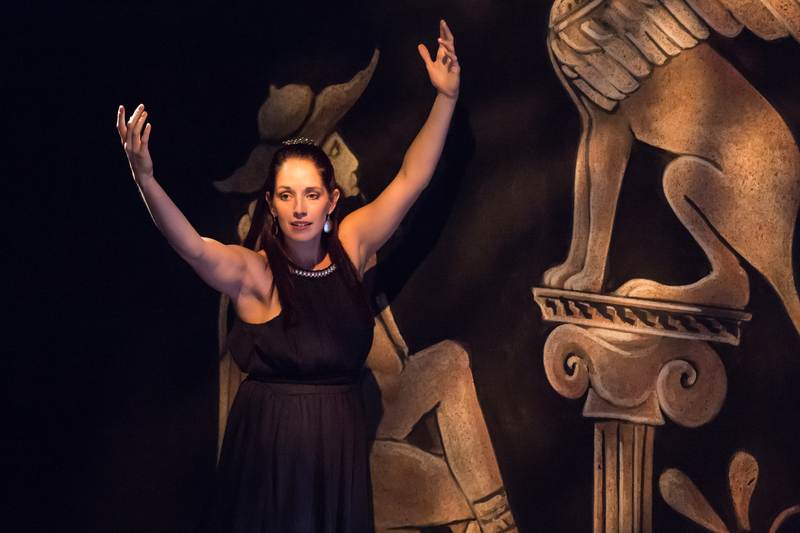 From 414 BC to 2014, echoes of tyrannical rulers and innocent victims resound at Upstream Theatre as they present a very timely production of Sophocles’ “Antigone.” With a new translation by David R. Slavitt, this is a most relevant and approachable production. Creon makes the decree that, of two brothers recently killed in battle, only one will be honored and the other shall be left unburied on the battlefield to be feasted on by birds and animals. With the news recently that a young man killed in North County was left dead on the streets of Ferguson for a seemingly unnecessary length of time before being removed to the morgue, the irony across the ages cannot be overlooked. Eteocles receives a heroic burial while his brother, Polyneices, lies as carrion for the vultures. Their sisters, Antigone and Ismene meet and Antigone vows to bury her brother in defiance of the proclamation from the King of Thebes. When a guard discloses his discovery of Antigone burying her brother, Creon is adamant that she shall be punished, despite the fact that his son, Haemon, is planning to marry Antigone. When he locks her in a cave, a blind soothsayer reprimands Creon and tells him the Gods are not pleased with his decisions. A messenger verifies the tragic results of his actions and he is left to suffer the losses he incurs from his stubborn and unwise choices. Peter Mayer is intense as Creon. He boasts and commands respect for his decisions and then falls apart emotionally as he carries his dead son on stage and realizes he has lost everyone including his beloved wife. As Antigone, Maggie Conroy is equally defiant in her quest for honor for her brother. A fiery performance that stands up to the intensity of Creon. As her sister, Ismene, Wendy Renee Greenwood continues her mastery of the stage that has been steadily earning her laurels. She also takes on the role of Creon’s wife, Eurydice and, without a word, expresses emotions beyond what can be said for her pain and sorrow. The three Theban Elders act as narrators and, at times, an unwanted conscious for Creon. 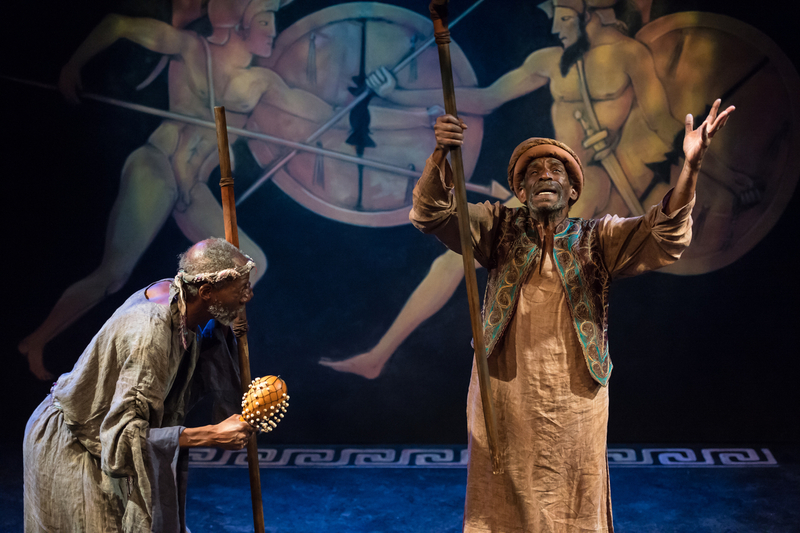 Dennis Lebby, Norman McGowan and Patrick Siler have most of the onstage time as they comment as representatives of the people of Thebes and play lackeys to Creon. They also provide the musical accompaniment that often becomes a part of any Upstream production. John Bratkowski also pulls double duty- as the hapless guard who must deliver the news of Antigone’s defiance to Creon and then as the soothsayer who chastises him. 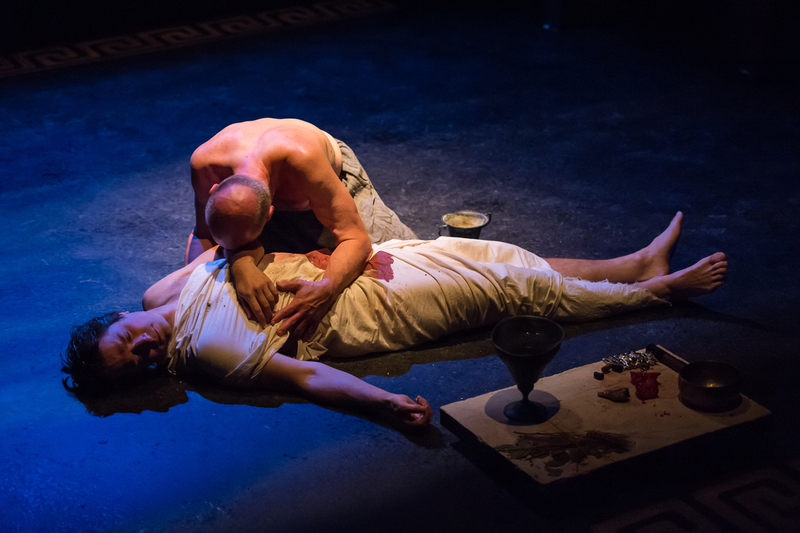 Andrew Michael Neiman is strong as Haemon as he also decries his father’s actions and then decides to show his defiance to Creon in the most tragic way possible. Rounding out the cast is a remarkable performance by Nancy Lewis as the Messenger who brings Creon’s world crashing in around him. Artistic Director of Upstream, Philip Boehm, handles the directorial duties of “Antigone” with and eye for the classic it is while still making it a play with great audience appeal. It speaks well and, with that contemporary tie-in, makes it even more powerful than usual. The Michael Heil set design is stunning in its simplicity and LaLaonnie Lehman’s costumes are spot on. Steve Carmichael’s lighting design enhances the production as well to make this a production not to be missed. “Antigone” plays at the Kranzberg Center through October 26th. Give them a call at 314-863-4999 or visit at upstream theater@sbcglobal.net for tickets for more information. This entry was posted on October 13, 2014 at 9:43 pm10 and is filed under Uncategorized. You can follow any responses to this entry through the RSS 2.0 feed. You can leave a response, or trackback from your own site.